Twenty five odd years ago Chris and Bryan set out in an old bus to sell Chai at WOMAD. That early humble beginning of Madras Cafe might have reminded them of their time in deep rural India in the seventies. Sixties and Seventies were not just about hippies and beats. It was an era when the young were trying to make sense of their lives. Find a deeper meaning both for themselves and the world they lived in. The impact of Hiroshima was beginning to sink in. Racism and inequality were being seriously questioned in the western world for the first time. It was also an era of globetrotting when western youth traveled the world in search of an idea, a purpose. Mostly in buses and trains, often hitching a ride from truck drivers. For Chris, Ivan, Bryan and many many others it was a life changing experience. For Chris and Bryon this might have been a one off event. Good for publicity of the work they were doing for a charities in India. Not in their wildest dream would they have imagined to-day’s Madras Cafe. Masala chai continues to be a favourite of the festival fans. But they can now also have a thali, dosa-vadai, chat samosa and mango lassi! All at reasonable prices. From a small chai stall, Madras Cafe has now become a large tent! 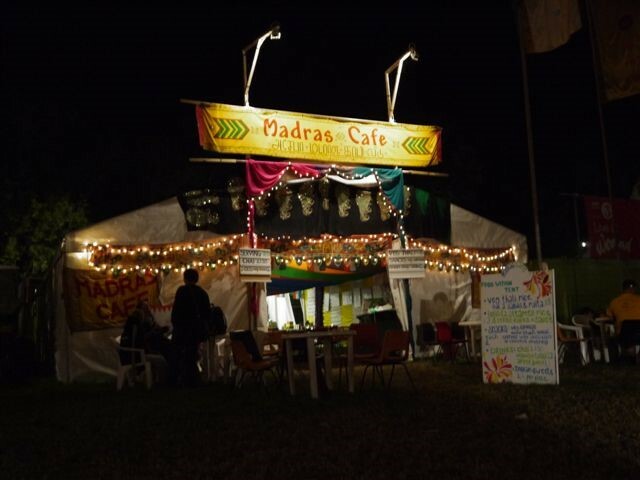 In 2016, Madras Cafe was voted the best WOMAD food venue. The Cafe is integral part of small charity Action Village India (AVI). 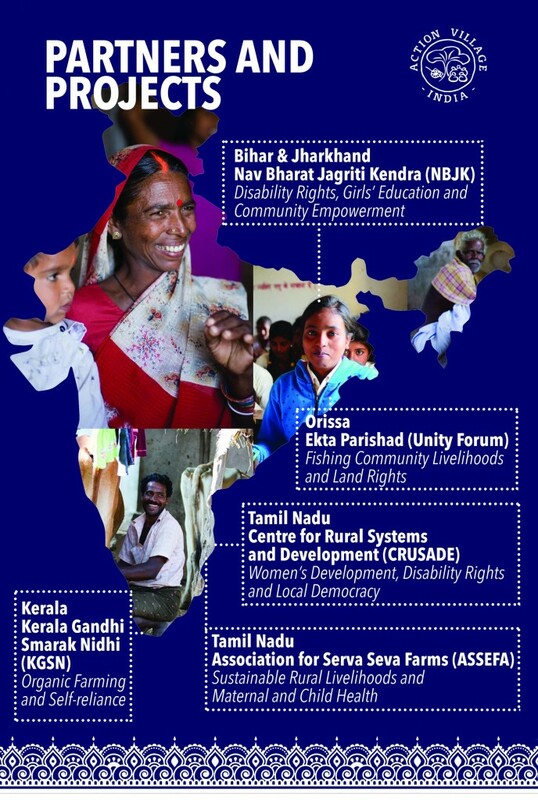 AVI started as a discussion group to support Gandhian organisations working in rural India. It was founded by Chris, Ivan and Bryan who had experienced rural India and wanted to give something back. Soon they were joined by other friends with experience in India. AVI soon evolved into a funding agency. Madras Cafe helps raise funds for AVI’s partners in India and awareness about programmes and issues they are involved in. 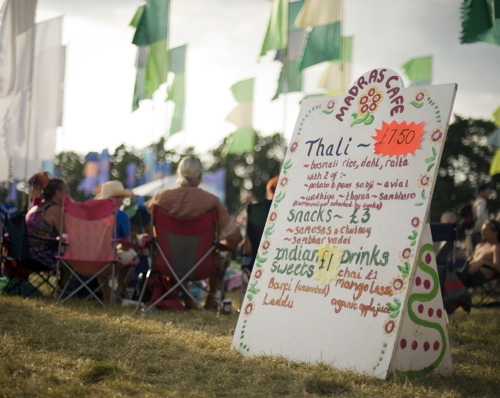 The Cafe is a now a vibrant part of the main festival of WOMAD held every summer – the event has now moved to Charlton Park, Malmesbury in Wiltshire. Every year a team of 90 or more volunteers from around UK and abroad gather to cook, serve and clean up – all for a purpose – to support AVI, its partners and the rural communities they work in. Over the years the volunteers themselves have become a community. Many volunteer every year. A short fun video captures the spirit of the Cafe Community. 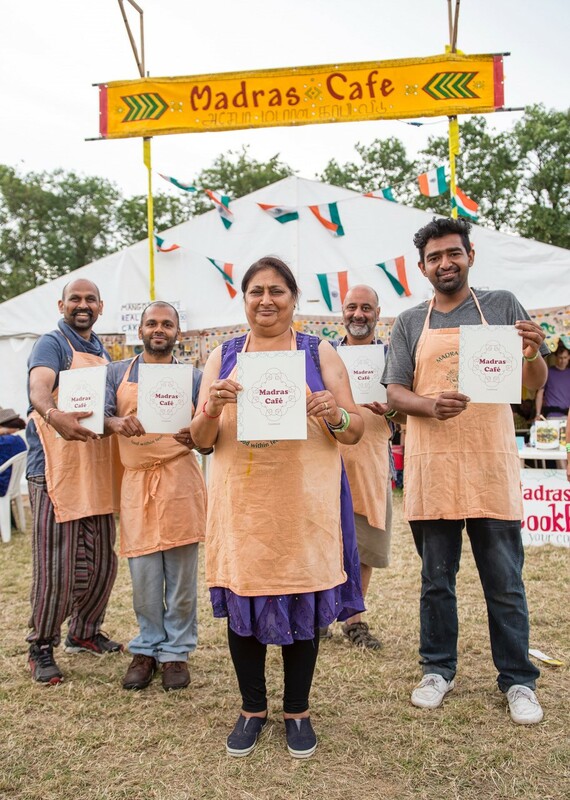 And soon, perhaps too soon, it is time for the volunteers to hang up their aprons and say good bye to WOMAD! But that is not the end of it. There are other occasions when they meet again. At other events of AVI or at other festivals where the Cafe now has a presence. 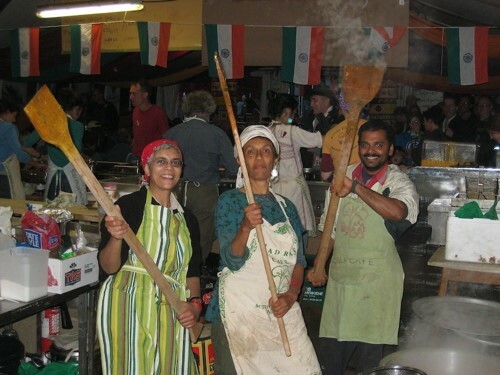 A few select recipes are available online – potato curry, onion bhaji and coconut chutney. But there is more, much more in the cookbook for vegan, vegetarian and gluten free recipes compiled by the cafe cooks. The cookbook can be bought at the Cafe or online. For £12 and with discounts if you buy more than one, it is a bargain! The cafe features and promotes the work of Action India Village. AVI has a long relationship with its partners – some dating back to 30 years when AVI was founded. Even futher in the past if we look at personal histories. Ivan, for instance, has known Satish and Girja since the early seventies. Satish and Girja were engineering students. They chose to work with the poorest villagers. They founded NBJK – thought it was a more meaningful option. They were not really cut out for working in the cooperate sector. Their conscience would allow it. The AVI exhibit this year has a focus on the disability rights work of NBJK. The programme now over a decade old has mobilised and empowered thousands of physically or mentally disabled people in Bihar and Jharkhand in north eastern India. You can download an independent assessment of the first phase of the programme which was funded by DFID here. If you know Hindi you might want to watch a 12 minute video here. Uday – now a proud owner of a tricycle. The cafe also has a small shop selling their cookbook and hand woven scarves. 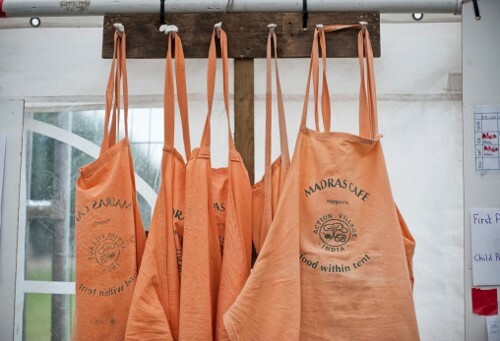 This year they will also be selling products made from khadi – the hand spun and hand woven fabric – the fabric that Gandhi revived and used to fight British rule. Don’t forget to have a look at the fully traceable khadi scarves of Where Does It Come From?, and the traditional Rajasthani puppets dressed in khadi from Khadi CIC. 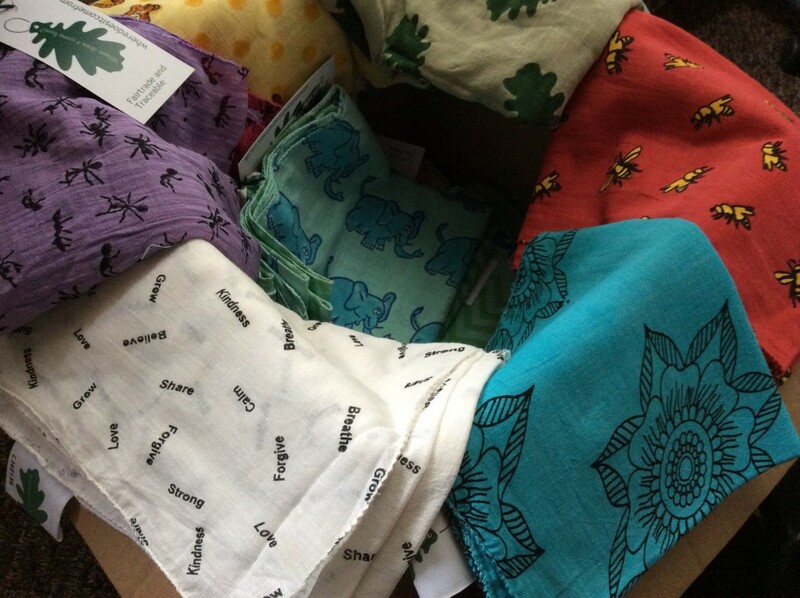 Scarves from Where Does It Come From? selected for the Cafe shop. 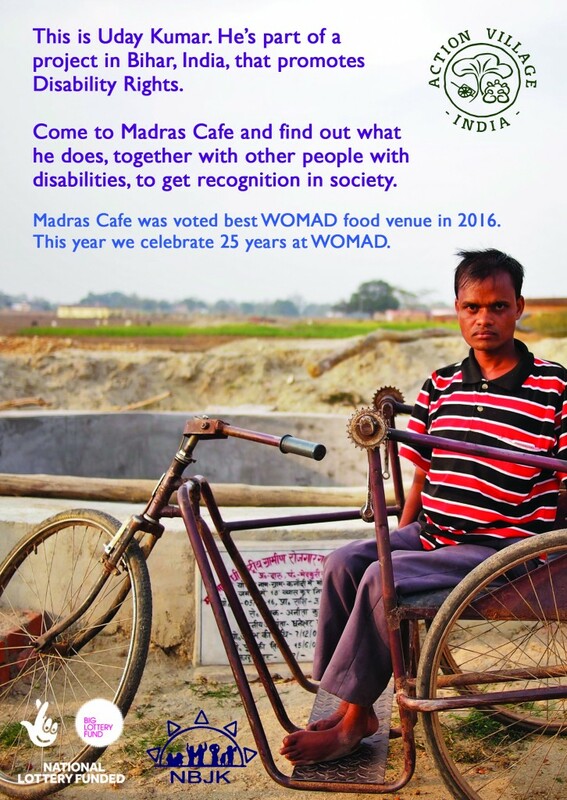 If you are going to WOMAD, don’t forget to grab a thali at Madras Cafe! Text: Kishore Shah with inputs from the Madras Cafe team.